In Mervyn Leroy's 1931 film Little Caesar, Edward G. Robinson plays a crook named Caesar, nicknamed Rico. Belligerent and ambitious, Rico claws his way to the top, but his best friend betrays him and the media turn on him. He dies, shot down when he has nothing left, uttering one of the most famous lines of early sound cinema. 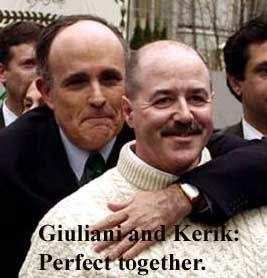 Rico Giuliani has yet to utter any Famous Last Words, but he will. Maybe later today. Still, he always was a “little” Caesar, a mean-spirited, vindictive man loyal only to his inner circle—much like Robinson's character in the movie. Read more about "Mother of Mercy, Is This the End of Rudy?"